Victor most kindly pointed out to me that I had transposed the name of the New South Wales Minister for Transport. She is not called Constance Andrews, but Andrew Constance. Rather an odd name for a women really. The story all began in England when an underwater craft was named Boaty McBoatface. Look at this link if you want to know the details but in essence subsequently a new Sydney ferry was named Ferry McFerryface by Minister Andrews Constance. 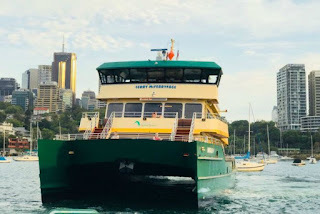 Only a couple of days later after the announcement, I learnt that the name Ferry McFerryface was only temporary. The unions thought the name was disrespectful to them and the ferry. The minister has been caught out, at the very least lying by omission. Photo from Our ABC. Writers of letters to The Sydney Morning Herald newspaper are outraged at the ministerial deceit, Murgatroyd McDonald of Mosman especially so. The writers of the letters to the SMH have been admirably clever with names for the minister. Twice recently the Premier has declared her full support for the minister. Remembering episodes of Yes Minister, he is dead duck walking. I reckon that someone from Victoria is bothering to write about NSW politics is just another nail in the coffin of Constance. We found it mesmerising. Radio is not attracting me much of late, so one Sunday we had on in the background some slow tv. The programme began at something like 4am and was still running by 6pm. It had no commentary, aside from what was written on the screen. Many different cameras were used, giving different views, but the cameras were static. There was also, I guess, drone footage of the train. Oh, I haven't said what it was. It was the Ghan train making the journey north from the southern Australian coastal city of Adelaide to the northern coastal city of Darwin. The journey is nearly 3000 kilometres and takes 54 hours at an average speed of 85 km/h. For many years there was a train to the roughly midpoint of Alice Springs and it was subjected very often to delays. In wet weather it was a question of how late will the The Ghan be? At times it was how many days late will it be and food parcels had to be dropped to the train when it was stranded in flood waters? One of the few good things former Prime Minister John Howard achieved was to see the extension of the line to Darwin, and following a new and much more weather proof path down south, so it was much less prone to delays. It is now quite an expensive train trip, especially if you travel in the top class, but I reckon it would be a pretty good trip. A couple of people we know have taken the trip. We hope to one day. The Ghan name is in honour of the Afghan cameleers who are an integral part of Australia's outback history. Very bored looking train driver. I loved the way The Ghan began in the relative green of southern South Australia and we then went out. When we returned, it was in hot desert country. Tuning again in later, we were in the green tropical north. Yes, slow, boring, but also quite mesmerising. Well, that is us buggered then isn't it. 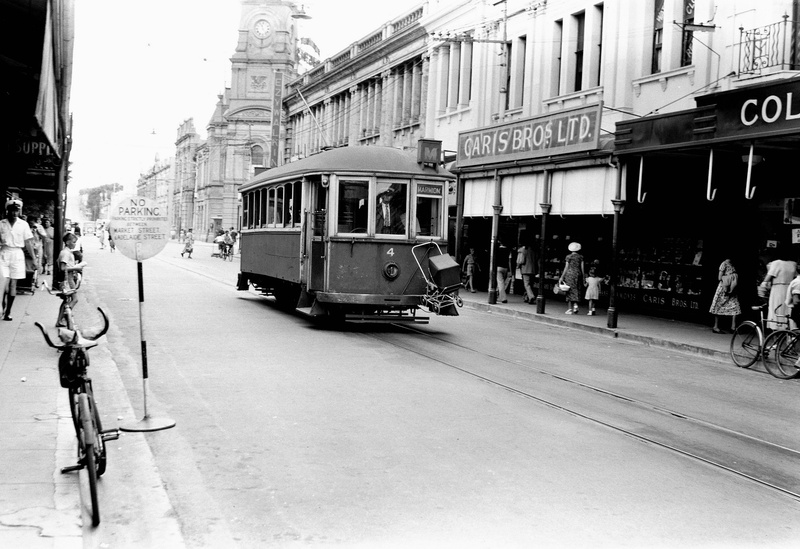 When we lived in Balaclava, on Saturdays when I was not working we would often catch the tram up Chapel Street to Prahran for brunch and general shopping but not food shopping. 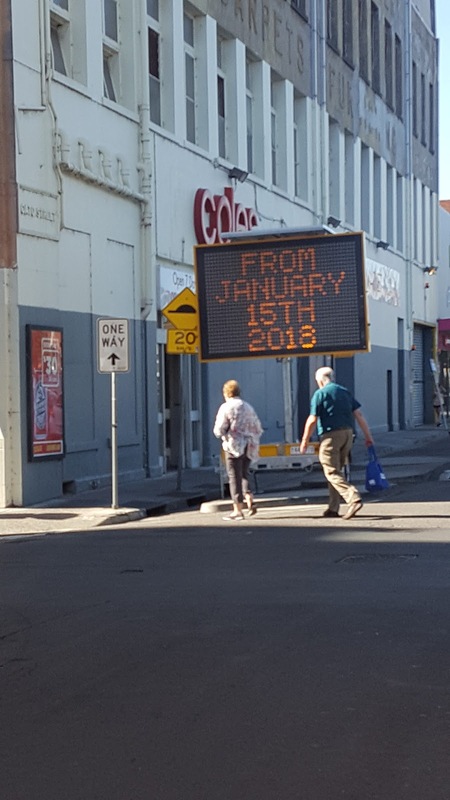 That was done in Balaclava by just walking to the supermarket every few days. R wanted nothing to do with Balaclava after we moved here. For the last 16 years or ritual has been, when I am not working or R on his own, is to drive to Prahran, park in the Cato Street car park and shop. Bordering the carpark is Coles and Woolworths supermarkets, with Aldi not too far away, and also the cheap liquour outlet Dan Murphys, or Dan's as we call it. There are some good and cheap places nearby to have brunch and we have become very good customers of Chemist Warehouse in Chapel Street and occasional customers of Priceline chemist and other businesses nearby. My doctor's surgery also borders the car park, as does R's optician, and my chiropractor is within walking distance. We arrive using Commercial Road and depart using Greville Street. We have to feed the meter in the carpark, at last count about $1.80 per hour. We usually stick in $2.50 to $2.80, guessing how long we will be. It is ever so convenient and we are so used to it. The car park was never a thing of beauty and the spaces too tight. Small concrete barriers were installed a few years ago to give space to parking officers space to walk along between the noses of cars. 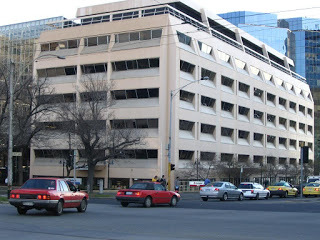 Much revenue for City of Stonnington comes from the car park. 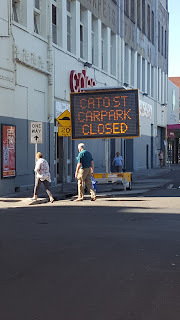 Now the car park has closed for the entire area to reinvented. 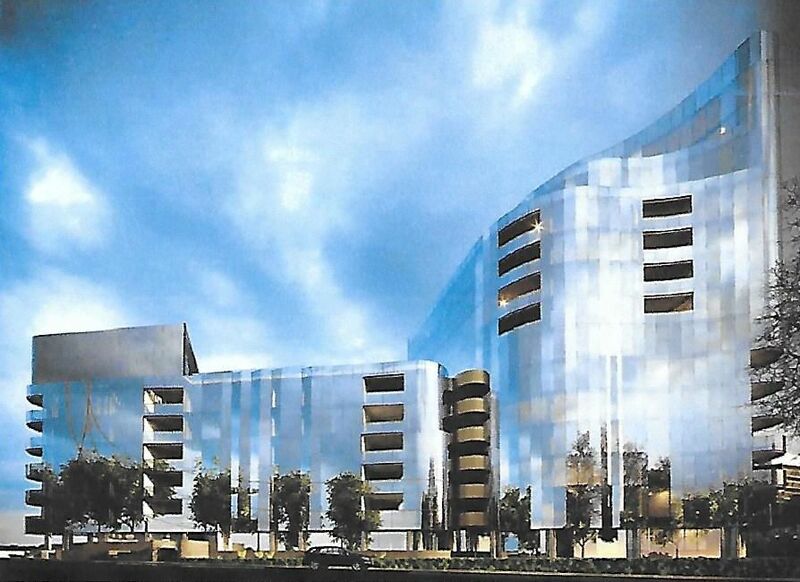 There will be underground car parking and a plaza where the just closed car park was. This is a great thing but leaves us without a car park when we go shopping. Take a look at what is being built. $60 million plus, completion in 2019. What do we do about our shopping? 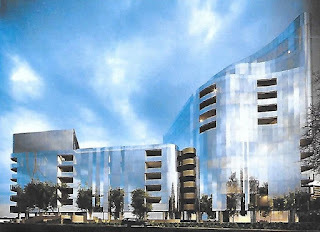 Alternative car parks have been suggested but they are not convenient to us. Prahran's loss is South Melbourne's gain. Two Saturday shopping days have passed, with me assisting for the first Saturday. We parked for free in the elevated Aldi car park, shopped in Aldi, shopped in Dan Murphy's in the same building, bought the famous South Melbourne Market dim sims to eat for brunch, bought flowers at the market, had great coffee at Brazil Coffee and then shopped for a couple of things at Woolworths. R did it on his own the following Saturday. Ok, we would prefer to be going to Prahran but the new South Melbourne shopping is not so bad. I will never love it though as it is hard to get there by tram. Just today we went by tram to Prahran, to visit Chemist Warehouse, Coles for one thing, brunch and then a visit to my chiropractor. 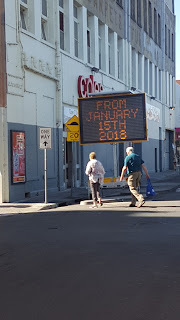 But Prahran has lost our big supermarket spend, and other lesser spends. I wonder how many are there like us? The stat counters of our customer loyalty cards must be concerned. It reached 39 degrees yesterday, 102F. 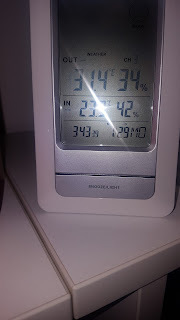 Well, it is summer and we knew it was coming, as we did a high overnight temperature, but look how hot it was at 3:43am. Some 40,000 homes lost power yesterday in Victoria, it seems from blown fuses in substations or at transformers. That is not good. But how about this snip from The Age. AusNet spokesman Hugo Armstrong said that as of 9.30pm, about 7500 homes were without power. By Monday morning, the figure had been reduced to 1500. AusNet look after the city's northern and eastern suburbs as well as eastern Victoria. "There are a lot fuses blowing in the hot weather and a significant power pull with people having put in air-conditioners they didn't tell us about," Mr Armstrong said. What? Since when do you have to tell your power company that you have bought an air conditioner? I think it is getting pretty close to being able to say almost everyone has an air conditioner and if they haven't, they will soon. But there are a lot of people who via roof top solar panels, generate more electricity than their air con and other appliances use, and so feed electricity back into the grid on these hot sunny days. I wonder whether you could leave your baby in the pram when it was hooked on to the front of a West Australian, Fremantle tram. I don't see why not. Peeps born in the 1950s are very resilient. Can you see the bike lane? Not everyone can. How do these people ever pass the driving licence test? Later edit: A couple of days later a sole car did the same thing. As you can see in this photo below, the conflict point is clearly marked with green paint. Perhaps that should be extended. We live on St Kilda Road, a proper boulevard. Every so often there is a push to rename it St Kilda Boulevard, but bugger orf. It is St Kilda Road. 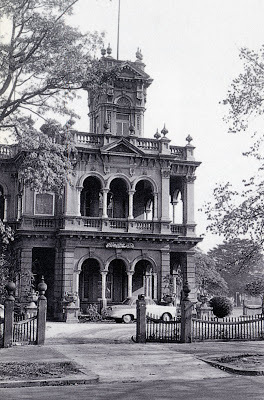 It was once lined with grand Victorian houses, most of which have been demolished. A book about the demolition company, Whelan the Wrecker, mentioned a worker who was involved in the demolition of Illoura. He was very experienced at knocking down buildings of the Victorian era. He was very troubled about knocking down Illoura. Illoura now, and there are vague plans to demolish this replacement building. It was improved by a clever paint job. So, many grand houses were knocked down for office towers to be built. However, we have almost gone the full circle with many of these office building being knocked down or adapted to build towers of apartments. Ours was one of the early ones. We live in the cheap house in the best street, now it seems. The Victorian Racing Centre was once here where we now live. I do vaguely remember it. At the time there was no reason to take much notice. Let me show you some of the recent projects and future ones. Where this building is was once Kings Cross Plaza. There was a huge 711 and a large brick paved plaza and other shops for local people. See the place with the large decked area. You want live there? Expect to pay millions of dollars to buy it and thousands to rent each week. More modest and seemingly built for rental, this apartment building was built behind Albert Park Manor, which was also converted to flats. When we moved here it was a boutique hotel. It was once a Catholic hospital, run by two sisters, at times a place where priests went to die. This is Lucient. It was was built where there was once a three storey 60s brick building, where on the ground floor of the building one could get our hair cut, buy a greeting card and buy flowers. Fifteen years in one place, one does see changes. This dominant building was a pale colour when we moved to The Highrise, quite shabby. It was repainted a dark grey that has faded over the years. No one could say it is lovely building. It is to be demolished, replaced with this below, which will actually sit better on the landscape and not be quite so tall. This one is a bit puzzling. 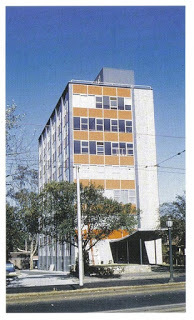 It was quite a modern office building of several storeys height on the corner of Bowen Crescent and Kingsway, but it has been goned. More apartments, I suppose. The low rise building now revealed has a central court and most of the tenants are in medical fields. It has just been painted dark grey and looks much better. Lastly, the ugly facade of the old police station can be glimpsed behind the wrap advertising the pretentiously named Mayfair. While it was going to be a building conversion to apartments, now I don't know. Note the architect........designing from the grave? Zaha Hadid 31/10/50 - 31/03/16. What are developers like!